The 4th national challenge, the Natacha in Czech Republic, is born the 1st of July of the year 2017. This new challenge shows 150 Czech cycling summits, distributed into 7 zones. This national challenge is very special in our heart, not only because we are happy to show you a new Natacha, but also because we were so sad to learn that the Czech member who was the creator of this list , the builder of this list, the father of this list, but who unfortunately hadn't the happiness to finish this list, was R.I.P. PAVEL VANIS, killed on the bike in Praha. Thank you, Pavel, for what you did for the cycloclimbing events in your country and for this creation without which, we 'd have had ten times more difficulties to find the good 150 ones in the beautiful country for cyclists that you loved so much..
Every coming member on the slopes of the Czech Natachas will climb with happiness thanks to you. We don't forget you. We"ll climb those natachas for you ! The country is quite mountainous. The western part of the country, Bohemia, consists of a basin drained by the Elbe and the Vltava Rivers, surrounded by mostly low mountains, such as the Krkonoše range of the Sudetes. The highest point in the country, Sněžka at 1,602 m (5,256 ft), is located here. Moravia, the eastern part of the country, is also quite hilly. It is drained mainly by the Morava River. What can you find in this list ? Here are some examples : tourism with the monuments dedicated to the battles in Moravia, professional races with the Bohemian Tour, the Czech Cycling Tour or the Peace Race for men and the Tourdufeminin for women, not forgetting the cyclo-cross classic races, altitudes over 1000m reached in the national mountains, beautiful sites with Bohemian paradises or Jeseniky landscapes for example, ski resorts and of course some walls like the terrible Tremplin Harrachov or Říp. That's the Czech menu. Just taste it with Pavel in your mind ! 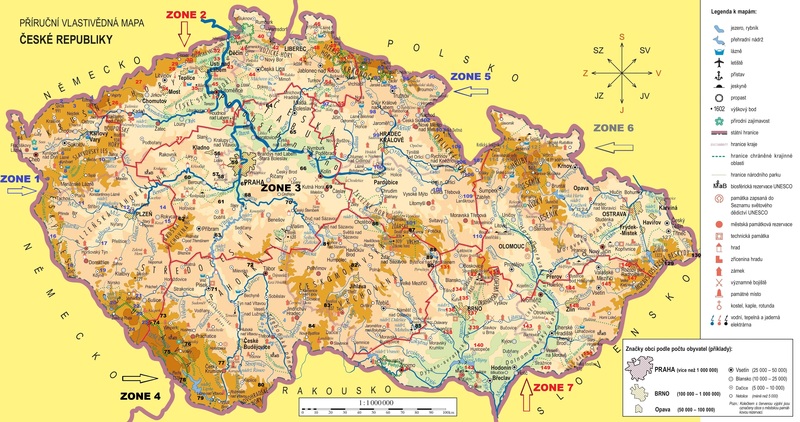 We divided the country into 7 zones, according to the 14 regions (kraj) linked two by two.